Living Charlotte Mason in California: Vivaldi . I think we've all heard the most popular of the Four Seasons, but have you ever heard his beautiful chorale Gloria or any of his other concertos? They are just beautiful. In our home, we haven't learned any music theory, haven't read much in the way of composer biographies, we haven't learned how to read music or what letters the keys on the piano are yet - these are all things I would love to delve into in the years to come. For now, they are just listening. They hum and sing along, they dance and march, they ask me to play specific songs they like, they describe what the music sounds like to them - a chase, a body movement, a scene. They say it's beautiful or "this sounds sad". I think when it comes time that they do learn more about music, they are going to have a store of recollections that are like old friends to them. Familiar in a way that brings a smile or an emotion, a memory or an experience, and most importantly, an appreciation and some intimate knowledge because of their unhindered relation to it. I recently stumbled across your blog! I LOVE IT! 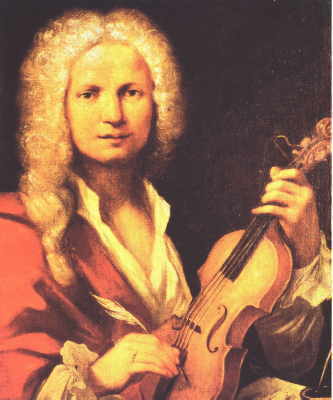 I just decided to do Vivaldi for our composer study. We have used selections from You Tube too at times! I listened to some of Gloria last night! :) We do very similar things with the music...talking about how the music makes us feel etc.